Immu-Stay is an expert formulation of 20 herbs and other powerful nutrients which have been shown to support immunity, naturally. Each ingredient has been carefully selected to help your body resist seasonal ailments and recover from symptoms faster. Immu-Stay is ideal for helping to maintain good health year round, and is especially effective as an extra immunity boost when winter kicks in. Immu-Stay has been designed to support the optimal functioning of your immune system. It is composed of a unique power pack of 23 herbs and nutrients which help build your body’s natural defences and keep ailments at bay. Immu-Stay can be taken year-round or just in winter, on its own or in combination with the Xtend-Life Core Wellness Activators including the Total Balance complete nutrient system. Your immune system is your body's ultimate defence against germs that can make you sick. Of course, the stronger your underlying health is, the more robust your immune system will be. While we can support our core health with a nutritious diet, good sleep and exercise, sometimes we need to give our immune system a helping hand, especially when the colder months arrive. Indian Echinacea (Andrographis paniculata) – Contains several active compounds that may have antimicrobial properties, helping your body fight off illness-causing bacteria. Beta 1-3 Glucan – Found in wild mushrooms, bacteria, yeasts and algae, beta-glucans may support immunity by enhancing the function of white blood cells. Olive Leaf Extract – Used in traditional medicine for centuries to treat illness and boost the immune system. Olive leaves have potent antimicrobial, antioxidant and antiviral properties and may help resist the growth of viruses, bacteria, yeast and parasites. Bilberry Extract – Contains a rich concentration of antioxidants and has anti-microbial properties which may be beneficial in fighting seasonal ailments. Turmeric – Helps build the immune system and fight illness through its antioxidant properties and immune system support. Black Cumin Extract – Used in traditional medicine for thousands of years, studies have shown that the oil in black cumin seeds may have antibacterial properties. Piperine – Gives pepper its spicy taste and may boost immune function. It also improves the bio-availability of the other Immu-Stay ingredients. Immu-Stay contains a unique blend of effective ingredients whose aim is to achieve results where other formulas fail. You may click on any of the below ingredients for more information, including clinical studies and references where applicable. Other Ingredients: Microcrystalline Cellulose, Dextrose, Clear Glaze (Talc, Polyvinyl Alcohol, Polyethylene Glycol, Polysorbate 80), Silicon Dioxide, Sodium Carboxymethyl Cellulose, Maltodextrin. Does not contain soy, dairy, gluten, crustacean shellfish, peanut. Daily serving: Men or women – 3 to 6 tablets. For optimal results split into 2 doses per day, morning and afternoon/evening, with or after food. Take 6 tablets per day if using Immu-Stay by itself. Take 3 tablets per day if combining with a full dose of the Total Balance complete nutrient system. If you have any questions, please contact our customer service staff. Combines well with Total Balance, Kiwi-Klenz and our Omega 3 Fish Oil products. 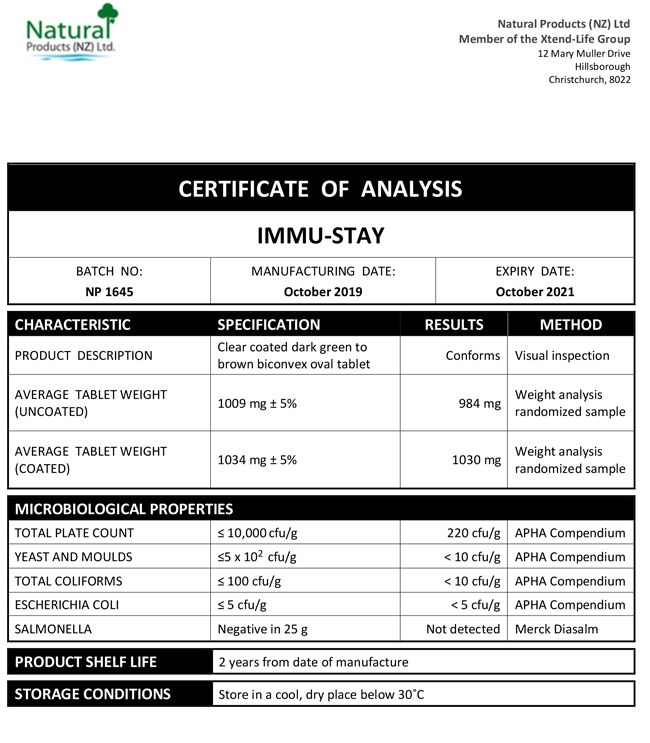 We have included below a copy of a typical Certificate of Analysis (CoA) for our Immu-Stay product. You will note that there are two columns which are headed 'Specification' and 'Results' respectively. The specifications are simply our minimum standard to which each batch of Xtend-Life Immu-Stay has to conform, otherwise we would not release it. The results are the actual results from the independent laboratory that did the testing. What are the benefits of Immu-Stay? Xtend-Life formulated Immu-Stay which contains 23 herbs and nutrients to give the additional support your body needs to maintain and regulate the normal healthy functioning of your immune system. For most people, taking Xtend-Life Total Balance provides sufficient immune system support throughout the year. However, you may need an extra boost to provide additional seasonal immune support or you may not be taking Total Balance but want an economic solution to build up your immunity. Immu-Stay may be useful in these instances. Your immune system is your body’s ultimate defense against organisms and invaders that can make you sick. It is a complicated network of cells, tissues, and organs which include antibodies and white blood cells. Immu-Stay may help to support the optimal function of this important body system and keep away those winter ills. Can I take Immu-Stay all year? Yes, you can take Immu-Stay year round if you chose to, as this is a naturally based product. It may be worth taking a break for 2 weeks each year to ensure that your body does not become over-reliant on this supplement. However, taking a break does leave you without the nutrients that you won't be getting from diet alone. We consider this to be a matter of personal preference. If you do decide to take a break, we recommend that it is limited to 2 weeks. Otherwise the benefit of the product will be reduced. How does Immu-Stay help to protect from the flu? Immu-Stay works to help boost your immune system to protect against flus, colds and viruses and also to reduce their severity and duration. Immu-Stay contains 23 herbs and nutrients to provide the additional support your body needs to maintain and regulate the normal healthy functioning of your immune system. Maintaining a strong immune system is your body's ultimate defence against organisms and invaders that can cause you to contract illnesses. For the ultimate in immune support we would advise combining Immu-Stay with Total Balance and Omega 3/DHA fish oil, especially leading up to and over the winter months when the spread of viruses is more common. Can Immu-Stay help me when I am already suffering from a seasonal ailment? Because Immu-Stay provides essential nutrients to your immune system, it may aid the natural recovery process and help with seasonal ailments. It can be used when already ill, to speed recovery. However, the best results will come when using it on a daily basis, long term to build a strong immune system, able to withstand contracting illness in the first instance. Immu-Stay provides a variety of essential nutrients to help support your immune system. These essential nutrients may be helpful in the natural recovery process and reducing the duration and severity of colds, flus and viruses. Can Immu-Stay be used by Children? We would not recommend this product for children, as it contains a number of quite potent and specialized ingredients. In order to support the immune system in children we highly recommend Total Balance Children's which has various ingredients to offer immune protection, such as Olive Leaf Extract and Vitamin C.
Total Balance Children's also contains many other ingredients to support children's nutritional needs and support organ growth and brain development. The addition of Omega 3/DHA fish oil would also compliment this well for the ultimate in immune protection. Is there any Vitamin C in Immu-Stay? Yes, Immu-Stay does contain this powerful nutrient that plays a key role in immune health. One serving (6 tablets per day) of Immu-Stay contains 160mg of Vitamin C, which equates to 267% of the recommended daily intake. How does Indian Echinacea work in Immu-Stay? Several active constituents have been identified in Indian Echinacea, including andrographolide; deoxyandrographolide, and other diterpenes. These are thought to have immunostimulant and antibacterial properties which help support the immune system and maintain the healthy process of phagocytosis as well as cellular function. Indian Echinacea may be more potent in supporting the immune system when combined with Siberian ginseng, which is also found in Immu-Stay. Can I use Immu-Stay at the same time as other Xtend-Life products? Immu-Stay can be used to 'top-up' your normal Total Balance regime, or as a stand-alone formula, prior to your desire for additional immune support. To see the best and most rapid results we suggest that you follow our 'recommended protocol' suggestion of 3 tablets per day if you are taking our Total Balance. If taking it by itself then you should use the full dose of 6 tablets per day. Can I take Immu-Stay during pregnancy? We do not recommend taking Immu-Stay during pregnancy. The only product we recommend for women who are pregnant or breastfeeding is our Omega 3/DHA Fish Oil, which may offer valuable support to the immune system as well as many other benefits for overall health. Is Immu-Stay suitable for vegetarians? Yes, this product is suitable for vegetarians to take.